By Peter Anderson 5 Comments - The content of this website often contains affiliate links and I may be compensated if you buy through those links (at no cost to you!). Learn more about how we make money. Last edited September 5, 2013 . My wife and I have pretty good credit. We've never missed a payment on any of our debts, have had a variety of credit types (installment loans, mortgages and credit cards) and the cards that we do still have, we've had for years. We're not too concerned about having a good credit score these days because we don't really use debt that much, we pay cash for most things. There is one thing that we DO need a good credit score for, however, that may be happening within the next year or two. Buying a house. When buying a new home it is important to stay on top of your credit situation as your credit score can have a huge impact on what rate, and what type of loan you can get. In the end it can save or cost you thousands of dollars. So today I thought I would do a quick review of why it's important to stay on top of your credit when looking for a home loan, and how to do it in a way that doesn't cost you very much. 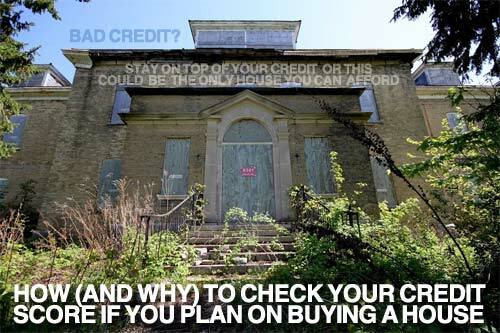 Where Can You Check Your Credit Report? Where Can You Check Your Credit Score For Free? Where Can You Get Your MyFICO Score? When you're buying a house having a good credit score is integral to getting a decent rate on a home mortgage. The better your rate, the less you'll pay both in the short term on your monthly payment – and in the long term in interest. It can also mean the difference between getting a longer and shorter term loan – which can end up saving you even more! Let's look at an example scenario in my home state of Minnesota using the calculators found at myFICO.com. Let's say you are you seeking a 30 year fixed loan for $250,000 to pay for a new house. Depending on your credit score range the rate that you get can vary pretty widely. Even if you have a good credit score, and not an excellent score, you're losing out on thousands of dollars in interest. 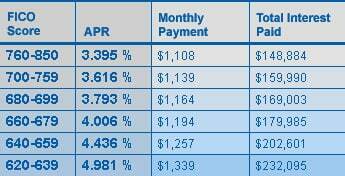 Boosting your credit score to the excellent category would save you an additional $11,107 in interest! Going from an average or poor credit score to a higher credit score range could save you even more! So be aware of where your credit score is, and do your best to improve your score! What a good credit score is can vary a bit depending on who you ask, but in general it's safe to say a good FICO credit score is going to be anything above a score of 700-720. In the 680-700 range, you've got average credit. If your score is 620 or below you'll most likely be tagged as a poor credit risk. Here's a general look at the credit score ranges. Payment History (35%): How good are you at making your payments, and making them on time? Amounts Owed (30%): How much credit are you using – how much do you owe? Length of Credit History (15%): How long have your accounts been open, and how long since you've last used them? New Credit (10%): Are you opening a lot of credit cards lately, or other lines of credit? Lots of inquiries for credit? Types of Credit Used (10%): Number of and different types of accounts. So it's important to stay on top of these things, especially when you're looking to get a large new loan like a home mortgage. Check out this post for a more in depth look at what a good credit score is. There are a couple of things to stay on top of when carefully monitoring your credit, your credit score and your credit report. Your credit report will be a detailed listing of your credit situation showing all of your accounts, loans, negative events on your record, missed payments, etc. In other words it will give you an overall look at your credit situation. You should never really have to pay for your credit report as you can get a free report from each of the big three credit agencies every year through the government site at AnnualCreditReport.com. Personally I like to stagger pulling my reports for each agency, and get one every 4 months to better monitor my situation. If you haven't pulled one in a while, however, and you're hoping to get a loan soon, you may want to pull all three. There are several places that you can check your credit scores from the three agencies, TransUnion, Experian and Equifax, for free. Keep in mind these credit scores are not the FICO score used by the banks when deciding on your rate, but they are similar and can help to inform you and give you a good idea of where your FICO credit score will probably be. You can currently get your credit scores from the big 3 agencies for free if you know where to go. Here is how I get mine. Credit Karma: Get your TransUnion credit score for free. Credit Karma Review. Credit Sesame: You can get your Experian credit score for free. Credit Sesame Review. Quizzle: You can get your Experian credit score for free here as well. Quizzle Review. Equifax: Get your Equifax score for free by signing up for a free 30 day trial. Just don't forget to cancel. Your credit score for the three agencies can help to inform you of approximately where your credit score will be when the mortgage companies check it. But where can you go to get your actual FICO score? MyFICO: FICO score from Fair Isaac direct via a 10 day free trial. FICO score from Equifax: a $15.95 one-time fee. Changing your credit score isn't an easy process and won't happen overnight. So if you're hoping to make a big purchase anytime soon, like a home, make sure to get your credit scores early, and do what you can to improve them by the time you finally apply to get a loan. Have a decent amount of accounts, utilize the credit responsibly, don't cancel old accounts and make sure that all of your payments are on time. Have you recently purchased a home and seen what kind of an impact a credit score can have? Hoping to buy sometime in the near future? Tell us your thoughts on credit scores and buying a home in the comments. Last Edited: 5th September 2013 The content of biblemoneymatters.com is for general information purposes only and does not constitute professional advice. Visitors to biblemoneymatters.com should not act upon the content or information without first seeking appropriate professional advice. In accordance with the latest FTC guidelines, we declare that we have a financial relationship with every company mentioned on this site. We’ve paid off over half our mortgage and just refinanced to lower the payment. We’re going to be looking for a new home this fall, and wanted to keep the payments low in case we held both houses for a few months. I’ve been using CreditKarma to tweak and adjust my credit. I started paying off my credit cards the moment any charge showed up on them. Turns out if you keep 1% balance on your revolving credit (as of the statements) it helps your score some. So now I keep a small balance with the cash set aside to pay it off as soon as the statement hits. CreditKarma also showed me that I did not have enough accounts. I opened a couple of credit cards (which I haven’t even activated). Now that lowered my average age of accounts which dinged my score (as well as some hard inquiries) but that should improve over time. It’s really nice to see what exactly is (potentially) affecting your credit score. Even if you’re not in the market for a new home, everyone should read this post! Great job breaking down everything you need to know about the credit score, how it works, and where to find it! I’ve used Credit Karma in the past, but was unaware of the other services you mentioned. Great post! I’ll be featuring this post in my weekend roundup of the best personal finance and frugal living posts from around the blogosphere. Thanks Josh! There are a lot of great free tools for checking up on your credit scores and report – it pays to take advantage of them! I agree with Shannon, having good credit comes in handy when doing a lot of things whether it be buying a new house or car to even renting. One should always remember to factor in payments to their credit lines into their budgets in order to make sure that their credit is tip-top.